Lorenzo Tañada, whose birth centennial is being celebrated this year, is a familiar fixture during Martial law leading rallies and demonstrations. During Corazon Aquino’s term, he was a staunch anti-US Bases activist and anti-nuclear power plant advocate. Bailen portrays Tañada as a person who metamorphosed from a graftbuster to a nationalist and, later on, a crusader of various causes. The book starts with insights into the childhood of Tañada. Bailen explains that his actions in life were governed by the philosophy ingrained in him by his mother. The phrase “fear of God is the start of wisdom” guided him in all his dealings. This clear-cut sense of what is right explains Tañada’s righteous indignation against the evils of his time. Thus, Tañada often takes an infallible stance against graft and corruption, inequality, and tyranny. An early example is the Tañada who, as an elementary school kid in Atimonan, joined a protest against the school’s American principal. The protest was prompted by the principal’s order for schoolchildren to stay during weekends to build a playground, preventing them from going home to their parents. Another example is the college student Tañada - ROTC major, lead actor in plays, national football team goalkeeper, UP Law student, - who, during UP’s Armistice Day, exhorted his fellow cadets to take their training seriously as they will soon be called upon to use their skill against the Americans if the country’s independence is not granted. In portraying Tañada as the lead actor in the socio-political events of his time, Bailen fails to de-mythify the man whom present-day UP students, incredulous as they come, have been acquainted with through the doting admiration of their elders. Surely the man could not have been perfect. Or did his reputation precede him such that any dirt on his pedestal “is a sacrilege [to his] memory?” The man was a political animal who incurred the ire of a lot of personalities. What did his enemies have to say about him? Bailen explains that the book is an attempt at a serious study on the Filipino leader. Yet the book is half a fulfillment of that goal since no study is complete without an investigation on the negative aspects of the subject, unpleasant or sacrilegious though they may be. Perhaps the fact that Bailen only had a year’s time to write the book is a reason why this is so. In her preface, she acknowledges that the book is not meant to be an exhaustive treatment of the subject. Rather, it is her attempt to understand Tañada through his life as a politician, his development as a nationalist, and his actions during Martial Law. But then, can politics be separated from the personal? What explanations are in order for Tañada as a father who was “detached” from his family? Or the Tañada as a husband who preferred his wife to stay home? Even the title of the book is misleading. Bailen may have wanted to convey Tañada’s life as a journey of Homeric proportions. If there is one thing though that lends this book a touch of Homer, it is the fact that Bailen succeeds in creating an aura of mythology around Tañada. Here is a man treated to paeans of praise from all sectors of society. A person honored by both the Communist Party of the Philippines and the Reform the Armed Forces Movement. A person whom even Benigno Aquino Sr. – charged by Tañada as a collaborator – acknowledged as a man of principles. Thus, Bailen’s portrayal of Tañada throughout the book has been that of the good man doing battle against all evil. TAÑADA: graftbuster, Nationalist, Crusader, Superhero. Bailen uses the edited life history approach in writing the book, allowing her to “focus either on the subject’s entire experience or a certain aspect of his life.” here then is a flaw that Bailen may have failed to foresee. By theorizing on parts of Tañada’s life, Bailen gives it a ‘value-meal” treatment where one is prone to take elements of a subject’s experience, find a theory that fits, and voila: Tañada, the nationalist, the transformational leader, etc. The treatment is always “Tañada this, Tañada that.” It is never, as a rallyist once introduced him, as Tañada, a Filipino. Such philosophical discourses though maybe to the liking of students who loved Social Science II as well as Political Science majors, which is no surprise since Bailen used her master’s thesis in Political Science on Tañada as an initial source of the book. The text is littered with political theories that attempt to explain Tañada’s actions as a student, politician, and leader. 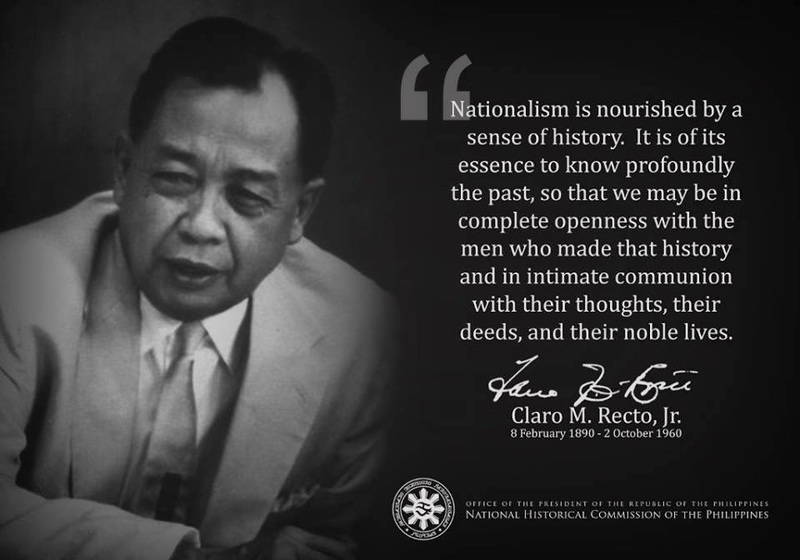 In one chapter alone, Bailen focuses on the relevance of nationalism in today’s world by quoting theories like Dr. Francisco Nemenzo and Renato Constantino. This is somewhat dragging and the reader, who might not be interested at all with theories that are better discussed in Social Science II, may well be tempted to put down the book and read something light. Bailen, however, acknowledges that the book is meant to be an academic perusal into Tañada’s life. As Bailen, in search of a graduate thesis, explains: “I decided that I wanted to work on the life and times and contributions of a major Filipino political leader who has yet to be studied in-depth.” Thus there are a lot of instances where Bailen is prone to intellectualize. In the first chapter, for example, she uses up to three pages to write about the history of Gumaca, Tañada’s birthplace, before starting to delve on Tañada’s childhood. Another example is Chapter 12 where Bailen writes down the reasons of each senator voting on the US Bases Treaty. One tends to ask what the point is in writing down the reasons of each senator when the focus is on Tañada. Perhaps she needed some space filler. Yet Tañada’s image alone is powerful in itself. His figure has come to symbolize protests against a tyranny, inequality, and corruption. His life is a celebration of a good man fighting against the evils of the world, a Don Quixote of sorts. His political dealings have been a moral beacon and an idealized role model compared to present-day politicians. Thus, the book comes as a refreshing insight into the life of a leader who knew how to care for the country more than his life, pocket, and reputation. At a time when the Senate has begun discussing the Visiting Forces Agreement, Filipinos of all generations should do well to read this book and find out why, at the twilight of his life and on the day of his dialysis, Tañada chose to attend the September 16, 1991 Senate discussions on the US Bases Treaty. Then they would understand why, when the Senate rejected the treaty, Tañada, old and sickly, stood up and with every breath he can muster, shouted “Mabuhay.” It was a fitting climax for a man fighting to set his country free, a fitting end to the Grand Old Man’s life-long struggle for freedom. If only because of this, the book is worth reading.